The creation of the National Health Service in 1948 was the latest in a string of major changes for Britain’s hospitals over the first half of the twentieth century. As a result of which, in the decades since the First World War, they had become firmly established as community institutions. At the turn of the century, different sections of the community had very different relationships with their local hospitals. The middle classes were likely subscribers to the voluntary hospitals while supporting public hospitals through the rates. Yet they would not usually have received treatment in either, favouring instead the doctor coming to them or a stay in a nursing home. Meanwhile the respectable working classes would seek treatment in the voluntary hospitals, where they would be seen by volunteer doctors and surgeons, who in turn built up experience and enhanced their reputation by treating the masses. The less attractive option of ending up in a poor law infirmary was the reality for the poorest or those with difficult conditions, such as the elderly or the chronic sick. The only other public hospitals at that time – sanatoria for infectious diseases – were no less desirable, serving to quarantine as much as to cure. It was thought to be a civic duty of the middle classes to fund the medical care of the sick poor, but between the wars this changed. Medical technology meant there was a clearer advantage to being treated in hospital and demand for admission increased massively from a broad cross-section of society. At the same time, local authorities began to take over public hospitals from the poor law unions, turning them into general hospitals for all classes. This went some way to democratise the hospital as a site of community and break down the distinction between those who paid and those who were treated. The logical next step was to ask for a financial contribution from everyone. But did this turn supporting the hospitals into paying for treatment? Certainly it became much more common for patients to make direct payments to the hospitals. And the rise of hospital contributory schemes – with around 10million members at their peak – cannot be ignored. This exempted many working-class members, and towards the 1940s a growing number of higher-paying middle-class members, from any possible payments if admitted. 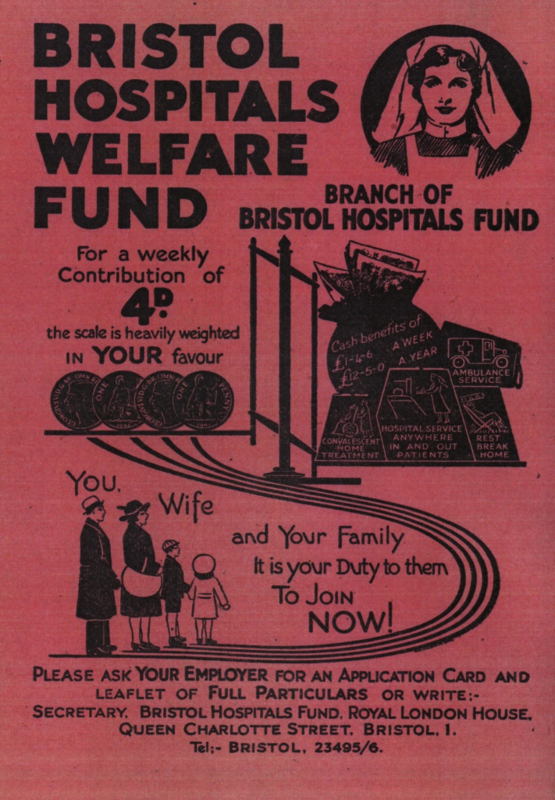 However, they also were a way of collecting funds for grants provided for the general upkeep of the local hospitals (half of their spending in 1930s Bristol) or to support large-scale initiatives to modernise hospital services (such as Sheffield’s Million Pound Appeal in 1938). While it may have looked less like old-style philanthropy, collecting funds for the hospitals from the middle classes remained strong throughout the interwar years. Raising funds or collecting gifts in kind for the local hospital also became a major focus for community activity in the 1920s and 1930s. As well as financial appeals there were collections of eggs, tinfoil and clothes. There was a sense of fun, with hospital carnivals and concerts, whist drives and dances, as well as the involvement of football clubs and the student rag. While its was ultimately too much for charitable income to keep up with rising costs and increasing demand, the innovation and energy of community fundraising is an important part of many local stories of the pre-NHS days. It was the end of what had been before 1948 a rich culture of local hospital fundraising. Yet Bevan wanted “a lively local interest” maintained through volunteering in linen leagues, canteens and libraries. Asking for donations of time was to be encouraged; not so when it came to donations of money. The separation of delivering healthcare and funding it was evident in the instruction that staff should only raise funds on their own time, out of uniform and for “outside voluntary efforts”. Hospitals were free to accept donations, but they were to be raised by supporters and independent bodies. Hospital fundraising was not to be ended so much as exiled. In practice, however, the charitable appeal of the hospital proved too great for such a tidy distinction between community spirit and community fundraising to be entirely maintained. The stage was set for a difficult balancing act throughout the 70-year history of the health service. George Campbell Gosling, Payment and Philanthropy in British Healthcare, 1918-48 (Manchester University Press, 2017) – available as an open access free e-book here.